We know that not all our members are Christian, but we are, and Charlotte Mason was a member in good standing with the Church of England and a woman of strong and deep faith and love for the Lord, and she included hymns in her programmes, and so do we. On our FB group today, somebody asked for help finding hymn links that have both words and music together, because she doesn't know the hymns and does not read music, so it's hard to learn them from just a midi file with lyrics. Another suggestion- search acapella versions- that will help you match the words to notes. 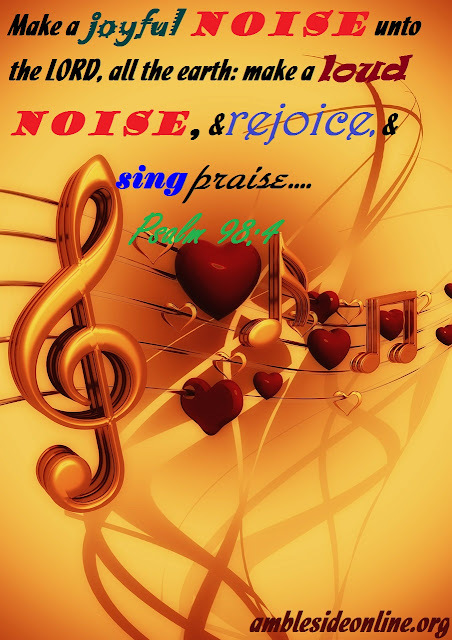 You can also find acapella versions by looking including in your search terms Primitive Baptist, church of Christ (all three words in quotations), Mennonite, Sacred Harp, OR Shaped Note Singing. The first two groups sing without instruments, so all their hymn selections will be acapella, or voice only, which makes it easier to learn a new melody. Mennonites often do (depends on the group), and Sacred Harp or Shaped Note singing is the fa sol la tradition, and also acapella. I grew up in an acapella singing church, so that's my first preference. I can't even figure out where to sing along with songs that have really strong instrumentals. I also tend to prefer somewhat unpolished, average joe and jane versions because I want the children not to be intimidated out of singing the songs- and singing the hymns, not just listening to them, is our goal. When we added hymns to the line up nearly 15 years ago, we discussed our varied backgrounds in hymn singing. I'm not the only one who grew up acapella, singing hymns with the family on long car trips, while doing the dishes, to comfort ourselves in time of need. But you needn't grow up acapella to have that rich treasure. One of us told the others lovely stories of her mother and aunt singing through the hymns they knew while they did the dishes in a tiny apartment that I always picture looking exactly like the kitchen in The Honeymooners). But you don't have to use my playlist. I won't know if you pick your own unless you tell me and if you do, I will only rejoice over you caring enough about the hymns to pick a line-up that speaks to you. In the book of Acts in the New Testament, Paul and Silas were in prison (chapter 16, verse 25). Do you know what they were doing? They were singing. Their hands and feet were bound, so they weren't playing any instruments. The Word does not say, but I it's pretty safe to believe the Jailor was not accompanying them with a psalter (he was not yet converted). They were singing- and I must surmise they were able to do this because singing was already their practice and they already knew the words. That's also something we hope for with AO's students- that hymns will be there to sustain them in joyful and heartbreaking times, that their souls will be nourished by learning- and singing- these songs of the Christian faith. A Charge to Keep I Have will be confusing, I think, because I included more Black American versions than anything else. They have a gorgeous 'lining out' hymn tradition that gives me delicious goose bumps, it's so pretty. But it's not what most people who have never been in black congregations in the south will be used to. There are two tunes I am used to singing with Take My Life, and I used both of them. 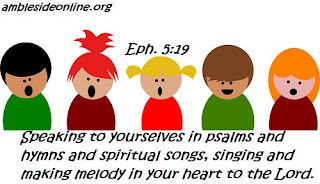 Several of the hymns have variations in their lyrics, or have multiple verses, and one group might sing three of them, and another four, or one may choose a different grouping of verses. If you sing the hymns, you can't fail. If you falter, miss a beat, go up when you should have gone down, create a new verse by combining the first half of one verse with the last half of another, go down when you should have gone up, hear your voice catch and crack- none of that is not failing. If you cannot carry a tune in a bucket or you get your pitch by scraping your shoe on a rickety wooden floor, or even by scratching chalk on chalkboard- that's not failing. There is not doing it wrong or doing it right. There is only singing and not singing.